I’m writing this post from Canberra, where I’ve just finished an immigration business trip. It’s Saturday morning and my flight leaves at 1230, so I get up and take a walk through Civic – the Canberra city centre. The picture above might depict Canberra as cloudy and rainy, but today it’s a beautiful November Spring day, with clear blue skies and a light cooling breeze. Perfect weather, and no humidity. Canberra was created in the early 1900’s after Federation in 1901. It’s a purpose built, planned city, halfway between Sydney and Melbourne, and is Australia’s Capital Territory and home of federal politicians. 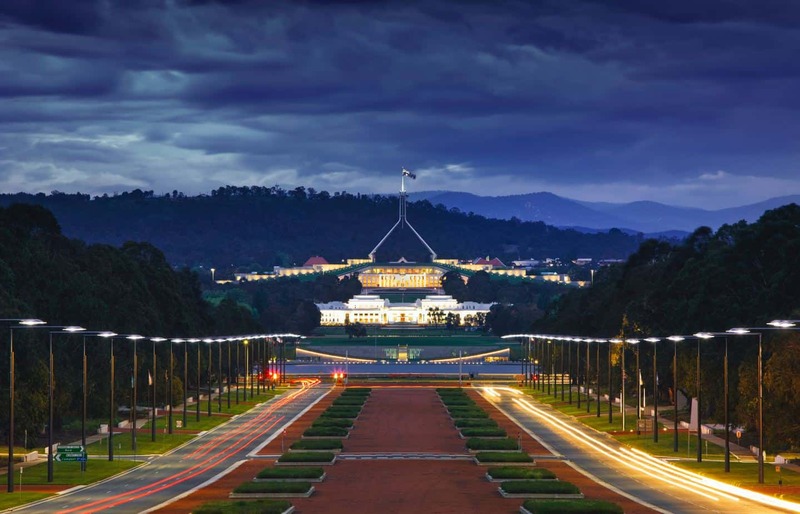 What’s striking about Canberra – apart from Parliament House on the Hill – is the cleanliness, the modern structure, pristine gardens and lakes, lots of street art, beautiful buildings, innovative architecture, and lack of traffic congestion. It’s compact, easy to navigate, and full of trendy cafes. Admittedly it’s Saturday morning, but you could shoot a cannon through the main street right now. Perhaps at 10 am it’s too early for most Canburnians to be up, apart from a few people sipping lattes in a breakfast bar. Having completed a bit of shopping, it’s time to go to the airport, so I walk out of the mall and start to look for a taxi rank. Right in front of me is a bus, with the door open, saying “Canberra – Airport”. How lucky – I’ve accidentally found the airport bus, with a very friendly driver, and the cost is $4.90 for a one-way trip of about 20 minutes. Much cheaper than a taxi ride! The short drive to the airport takes me past the Royal Military Academy – Duntroon- and the Australian War Memorial, along with scenic countryside. The airport is modern, well maintained, with an immaculate lawn out the front. Airport check-in is uncomplicated and there is virtually no wait time. Straight through security, encountering friendly and unstressed staff at the airport, and into the airport lounge. There are plenty of seats, it’s quiet and peaceful. A big contrast from the larger cities. Most of my business travel is between Brisbane, Sydney and Melbourne, and the contrast is startling. Arriving at Sydney airport, I’d normally take the train to the city and, at peak hour, I’m lucky to be able to squeeze on with my luggage and stand in the doorway. It’s a fast and furious pace, going with the flow of commuters into the city. As I travel around Australia, it’s easy to see why the Government is concerned about congestion in the cities of Melbourne and Sydney, and is more intent on focusing migration efforts on regional cities and towns. In the next few months I firmly believe we will see migration policy change to make it much more difficult for skilled migrants to access city areas as a first destination. Encouraging skilled people to regional centres where they can secure employment and become settled, will help to bring those towns and smaller cities into their own. It will create new business, stimulate local businesses, and add to the ever-expanding cultural dimension of Australia. Growth in cities and tax revenue will facilitate infrastructure spending. I can relate to life in Canberra as I grew up in Hobart, Tasmania, another similar sized regional city, with similar weather. 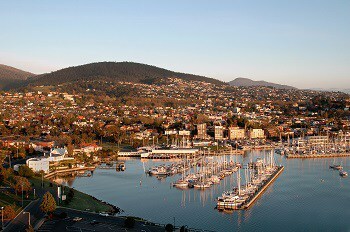 In Hobart, I was fortunate to live on a farm, approximately 2.3 kilometres from the CBD. I kept my horse at home in the paddock and rode him in the bush reserve behind our property, towards Mt Wellington. We had everything we needed, on about 30 acres of land, within walking distance to the Hobart city centre, without the complexity of a big city. Although I live in Brisbane now, I’d have to say that I feel most at home in a regional city centre. Regional Australia is fair and squarely on the Government’s radar right now. The population debate which has been in the media for the last twelve month, is focusing on congestion and burdens on infrastructure from a rapidly increasing population into Melbourne and Sydney. Statistically, in Australia, 2/3 of the population lives in the cities, and 1/3 lives regionally. However, of all migrants coming to Australia, 80% move to the major cities. Visa opportunities in regional centres will become much more evident over the next 12 months. New Visa Opportunities are now available in Canberra! It’s been a bit hard for would-be migrants to make Canberra their permanent home lately, because the ACT Government suspended State Nominations for 190 visas for several months. This has also made it very difficult for Canberra based students to identify a residency pathway after completing their studies. However, this is changing, and the ACT State Nomination program will re-open to local and overseas applicants on the 29th November 2018!! Due to high demand for all places, the ACT Government has introduced a points system of their own, for would-be 190 applicants. This is not the official Immigration points test; so in order to be successful you must meet the Immigration points test, AND also meet Canberra’s points test. ACT aims to assess a range of factors which historically lead to a successful re-settlement; including previous residence in the ACT and other ties; English proficiency and employment in the ACT. With 85 occupations “open” from November 29, there will surely be high demand for positions. Click here for details about ACT Government’s new process and occupation list. What about the Canberra weather? Canberra’s climate is much more temperate than northern Australia. But, not everyone is suited to life in the tropics – although it’s lovely for a holiday. Yes, Canberra does get cold in Winter – 11-14 degrees average during winter months. Canberra is inland and not far from the ski fields of Perisher and Thredbo. In Summer it can get quite hot, and the average temperature is 26-28 degrees. The temperature variation also means it has distinct seasons. In Autumn Canberra is awash with orange and red leaves; and in Spring, the famous Floriade Festival is held, an explosion of colour throughout beautiful botanical gardens. What an opportunity to live in a city which is small enough to be convenient; modern enough to be chic and trendy, not too far from beautiful southern New South Wales coastal beaches, and driving distance to snowfields. In Canberra you could choose to live in a suburb, or on acreage less than 20 minutes from the civic. Public transport is efficient, and access to all other east coast cities is easy. Canberra was dubbed the 3rd Best City to Visit on 2018, by Lonely Planet. Find out more about Canberra here. When considering Australia, why not consider Canberra? They have awesome infrastructure just begging for people to use it! Be ahead of the pack! Contact Us for advice and support with your State Nomination and Visa!